Now, it is important to note before we begin this article that nothing has been proven as of yet, and I am sure that Pokerstars is investigating the matter right now. However, over the past day or so, a bunch of information has come to light that would be hard to explain away for GBMantis. It all started with the news that YourTimeIsUp had been banned from Full Tilt Poker due to his association with JJProdigy, and also due to the fact that JJProdigy had in fact logged into YourTimeIsUp's account. Over the next day or so, it was made known that JJProdigy had in fact logged into YourTimeIsUp's account to finish some major tournaments on Full Tilt Poker. GBMantis was quick to defend YourTimeIsUp and JJProdigy. It should be noted that GBMantis was a "student" of JJProdigy. Other students include Sorel "Imper1um" Mizzi and "YourTimeIsUp." Then, it came to light about a day later that "JJProdigy" had been playing under a number of different accounts on different sites (not a big surprise.) Basically, he would use seldom-used "dummy" accounts. 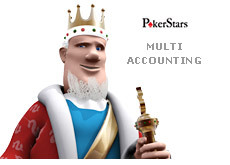 He would arrange through a friend of a friend to use someone's Pokerstars account, for example. JJProdigy's "friends", or people that he backs or has coached, would fund the account with money through player to player transfers, and JJProdigy would be free to play on this "dummy" account. Players that had previously only played $1 and $2 tournaments would suddenly be entering into some of the biggest tournaments on Pokerstars and doing very well. Then, when the dummy account was returned to the previous owner, the account would resume playing at the low limits, even though they had been fantastically successful at the higher limit tournaments that they had "played." Several people pointed the finger at GBMantis as one of the people who has helping to fund these "dummy" accounts, presumably to be used by "JJProdigy." Then, people took the additional step of investigating accounts of people with known ties to GBMantis. For instance, a room-mate of GBMantis who was a random donk, playing at low limits. This player goes by the name of "Mattisbest" on Pokerstars, and is GBMantis's room-mate. Now, if you look at the history for this account, you will see that on May 20th, "MattisBest" suddenly decided to play three high limit tournaments on Pokerstars, including the $109 rebuy, probably the toughest tournament on the Internet. Lo and behold, "MattisBest" took down the tournament for almost $40k. It should be noted that GBMantis came out on Pocketfives and stated that he simply "backed" MattisBest for these three tournaments. 1) MattisBest was a low limit donk, and suddenly he wins the toughest tournament online? 2) MattisBest never played any high limit tournaments after this, AT ALL. If you won $40k in a tournament, don't you think that you would try and play it just one more time to see how you did? The whole thing seems fishy, and I think that there is much more to this story. The influence of JJProdigy, a year and a half after his banning from most major poker sites, is just amazing. All we can do is wait for Pokerstars to conduct their investigation, and hopefully we will have more facts soon. Either way, this is certainly a black eye for online poker, if these allegations are proven to be true.